After turning on the heater for yet another English summer night, I decided the family needed a beach holiday. We began researching various resort options within the Four Seasons family— Mauritius… Seychelles….Sharm el Sheikh….I craved sand tickling between my toes, but knew the days of sipping fruity cocktails while reading a juicy novel were a dream of the past with our 17-month old daughter in tow. The warm sea breezes eventually flowed into the cold English Channel as we booked a holiday rental due South in Normandy. Though not geographically thousands of miles from home…. it felt more than a channel crossing away from work. And that was just what I needed most. Unfamiliar with this region of France, we scoured the Internet for short term rentals in a coastal city. Proximity to a beach and historical sights landed us in Honfleur. You arrive to this quaint coastal town by crossing the impressive cable stayed bridge Pont de Normandie. The first day we headed west to visit the infamous beaches of Normandy. First stop, Arromanches– site of the British invasion on D-Day where today the skeletal remains of the Mulberry Harbours are a peaceful oasis for marine life and coral. The museum in Arromanches has many wonderful artifacts from the era and its windows offer stunning panoramic views of the English Channel. We continued towards St-Laurent-sur Mer via the pastoral French countryside courtesy of our faithful navigation system. The fields were dotted with summer poppies and we found it hard to imagine such peaceful land in enemy’s hands just 68 years ago. 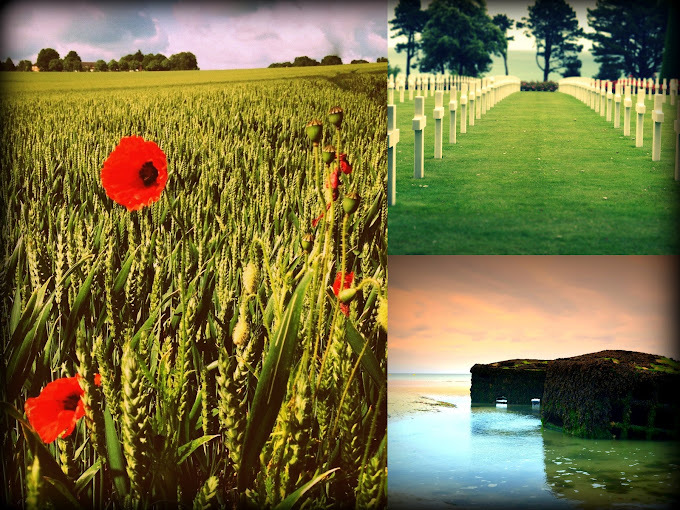 The Normandy American Cemetery is positioned on a cliff overlooking the beach of Omaha. Its sandy beach is one of the prettiest along the channel route. Tourist can walk down to the shore and in doing so, you begin to appreciate the treacherous condition those young heroes faced. The sentiment one feels while walking through the cemetery is hard to describe. Each cross represents the life of one soldier who was a child, a parent, a sibling, a friend, and a life that was cut short by war. Throughout the region are memorials and historic landmarks that remind us still today how so many nations came together to liberate Europe from further German invasion. 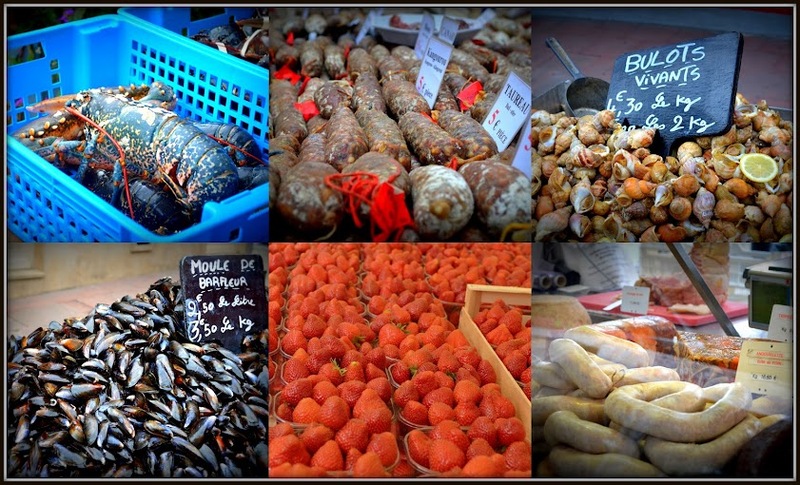 Aside from the historic war sites, one travels to Normandy because of its food. It is a dairy haven and not recommended for the stomach of a lactose intolerant! On our first day, I was formally introduced to lait cru who thereafter joined me daily in my coffee cup, spread on my bread and on my cheese plate. I ensured Cyrille did not skip his daily cholesterol pill… and debated if I should pop a few just to help the old arteries. There is milk. And then- there is lait cru. 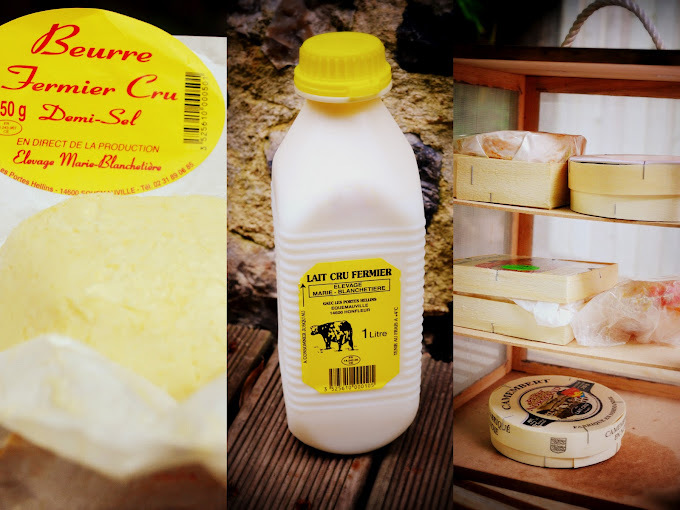 Lait Cru (pronounce: lay crew): n. Milk neither pasteurised or given other heat treatment, sterilisation. Does not exceed a temperature of 40 degrees Celsius, so as to stay close to the animal’s body temperature. The benefits of a holiday rental are many. My personal winner would be the fully equipped kitchen from which my Chef husband created culinary delights. We did not want for good food with fresh seafood sold direct from the fisherman’s boats, fresh produce from the Honfleur weekly markets, and the local cider for aperitifs. The best part about Normandy? No jet lag + no lines at immigration = more family time. I see why the British love to holiday in Normandy. The housing market is much more affordable for those wishing to buy a second home near the water. As well, you have an abundant supply of fresh produce and seafood, the French know how to make real cider, there are beautiful sandy beaches, and (the best part) you don’t have to spend a whole day travelling to get there. With no set agenda aside from visiting the Normandy WWII sites, we spent the holiday simply enjoying being with our daughter. In the early mornings she cuddled in bed with us. Then father and daughter would walk to the patisserie for fresh croissants and pain au chocolate. We played at the park, rode carousels in each beach town, and built sand castles for Ouisie to destroy over and over and over again…it was perfect. Of course the English Channel is not the Indian Ocean. And a home rental is not a luxury hotel that offers twice daily housekeeping or 24-hour room service. Despite these differences, it ticked all the right boxes in that it catered to us having a relaxing family break. I feel like I just walked the beaches of Normandy with you guys and can almost taste the ocean in that beautiful seafood! What a lovely family holiday and sweet memories to cherish! I loved Honfleur; I was there about 13 years ago, and it was so charming. Glad you guys made the great escape and what seems to have been a fab family vacation. Bisous!